CHICAGO, Aug. 21, 2014 /PRNewswire/ -- United Airlines today unveiled new, improved lunch, dinner and beverage choices for domestic first-class customers, offering travelers chef-inspired meals and premium beverages that elevate their in-flight experience. 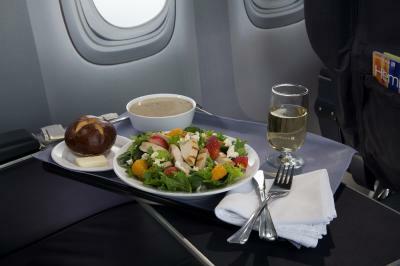 This month, United began offering customers in premium cabins on North America flights four new salad entrée choices – a Southwestern salad, an Asian-style noodle salad, a seasonal greens with roast beef and blue cheese salad and a Strawberry Fields salad – replacing the previous chicken and shrimp salad options. Photos are available at unitedcontinentalholdings.com. Live television on more than 200 aircraft, the world's largest fleet of aircraft with live television. United Airlines and United Express operate an average of more than 5,200 flights a day to 374 airports across six continents. In 2013, United and United Express operated nearly two million flights carrying 139 million customers. With hubs in Chicago, Denver, Houston, Los Angeles, Newark, San Francisco and Washington, D.C., United operates more than 700 mainline aircraft and, in 2014, will take delivery of 35 new Boeing aircraft, including the 787-9 as the North American launch customer, and will welcome 32 new Embraer 175 aircraft to United Express. The airline is a founding member of Star Alliance, which provides service to 192 countries via 27 member airlines. More than 85,000 United employees reside in every U.S. state and in countries around the world. For more information, visit united.com, follow @United on Twitter or connect on Facebook. The common stock of United's parent, United Continental Holdings, Inc., is traded on the NYSE under the symbol UAL.